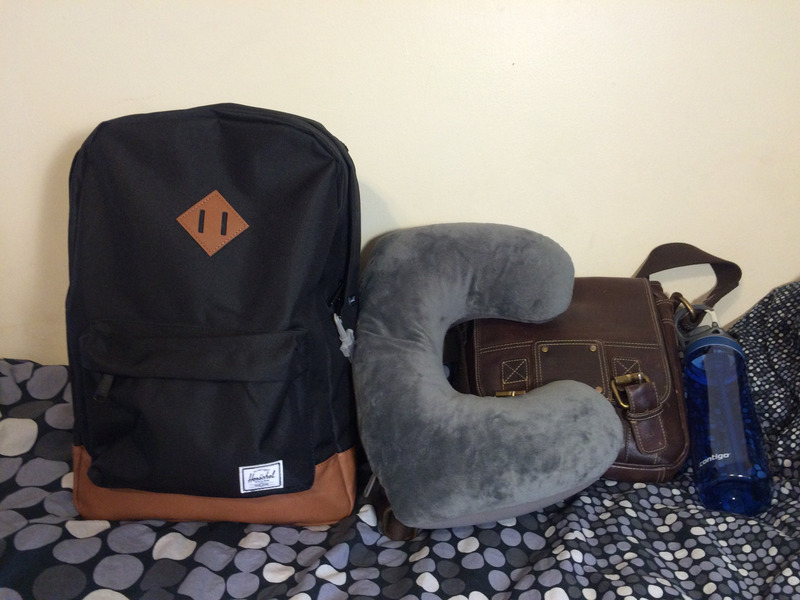 Traveling – From the end of bag. I’m the type of person who over-packs. No matter where I go, I bring more than I need, and if I don’t have all of my things with me I feel anxious. I just like knowing I have a certain something if a situation arises where I need it. 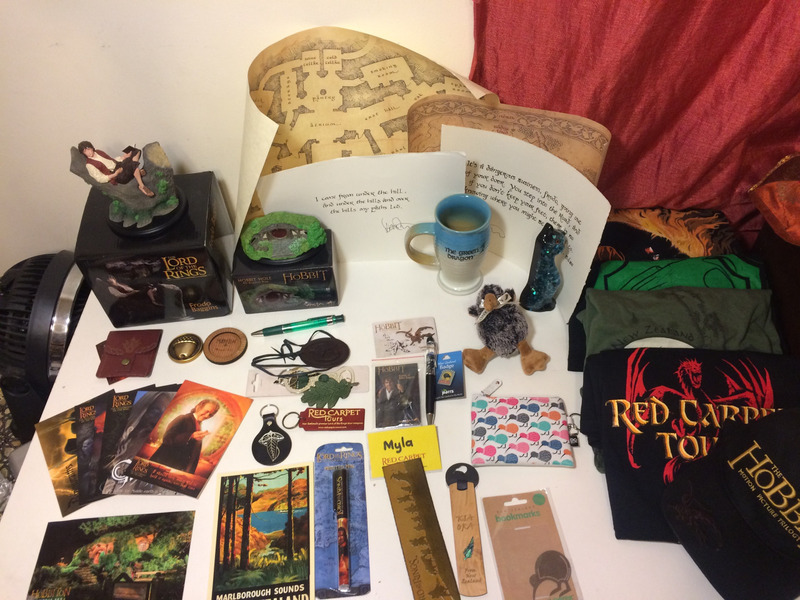 I’m going to be traveling with my mom later this month to a few countries in Europe (I’ll talk more about that later) for about 9 days, so I started thinking about what I’m going to be bringing. Oh, another fact you should know about me is that I usually pack way in advance because I get too excited. Forever upset that my tour with Red Carpet Tours is over, luckily I bought lots of souvenirs to help me remember it. Looking back I wish I bought more stuff, especially books! I have no idea how I managed to stop myself from buying more copies of LOTR and The Hobbit. The Hobbit cap – I never wear hats, but I bought this so I wouldn’t a get sunburn on my face. I gave it to my dad when I got home. Green Dragon mug – Every mug was different, the colors were never in the same exact spot which I loved. Green Dragon shirt – The back has some lyrics from the song. Hobbiton postcard – I should have bought more! Hobbiton Movie Set bottle opener – I don’t drink often so I don’t see myself using this any time soon but it’s so pretty! Obviously I needed it. Hobbiton Movie Set magnet – I love that it’s made from wood. I went to New Zealand!! It happened. I was in New Zealand for 18 beautiful days. It’s strange to read this post from about a year ago because at that point I thought I would be going at the end of this year. I’m so happy that I went when I did because my Fellowship was the best (I’m sure people say that every month but I’m right). I left for NZ on January 1, and my flights were just…not fun. Not to get too personal but I had BAD cramps the entire time, I was grumpy and I just wanted to get to Middle-earth as soon as possible. I arrived in NZ a day before my tour started which I didn’t want to do initially for $$ reasons, but it turned out to be a blessing because it meant I had a little time to recuperate before I met everyone and started my journey. I definitely made the right decision to go with Red Carpet Tours, they took such great care of all of us! I met Shane Rangi and sat across from him during the welcome dinner!!! It was amazing but the entire time I couldn’t figure out where to look — do I watch him eat? Do I very obviously not look at him?? He is a really nice guy and I still can’t believe I met such an inspiring person. I also need to add that he called James Cameron “Jim”, and if that’s not one of the greatest things you’ve ever heard I don’t know what to tell you. I WENT TO HOBBITON!!!!! I have cried just thinking about going there but when I saw everything in person I didn’t shed one tear. I was more in a daze, it didn’t feel like it was really happening! I loved it of course, but I have some thoughts to share on the entire experience. I’ll save that for later. I didn’t expect this to happen but the Trollshaws location turned out to be one of my favorite places! I’ve seen some beautiful scenery in my travels but WOW, everything was so blue and green and vibrant! I learned that most of the world calls pineapples “ananas”, and that ended up being a very intense topic for the rest of the trip. We got a special presentation from Daniel Falconer (basically Weta royalty) who I was lucky to meet last October at NYCC. If I wasn’t such a pile of anxiety I would have asked for another photo. Next time! Then soon after we met RICHARD TAYLOR, caps necessary. Pretty sure when I turned around and saw him I gasped/screamed, I don’t know it all happened to fast. After that I spent 80% of my NZ budget at the Weta Cave, not surprising. As if seeing Shane, Daniel F., Richard, and Jed wasn’t enough, the next day we met Daniel Reeve. DANIEL REEVE. He created all the maps, the “No Admittance” sign, he wrote in the Red Book of Westmarch!!! The guy is pretty much an art god to me. And I just need to tell you that he really does write perfectly straight, I’ve witnessed it and it’s amazing. A couple days later we visited the Jens Hansen shop and met Halfdan! 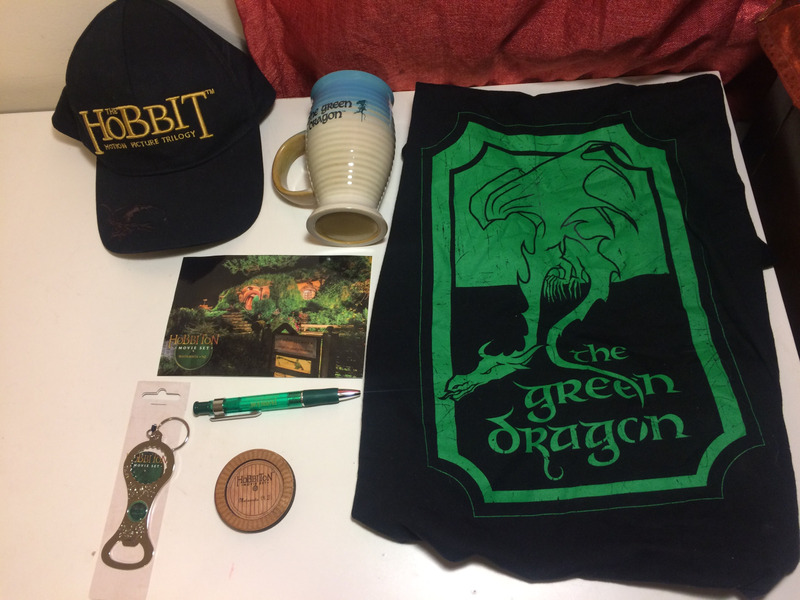 I mentioned that I was the winner of their first One Ring tumblr giveaway — which was back in 2012 — and he remembered! Later in the day we went kayaking from the barrel scene. It was a very eventful day, there was a capsize and I got stung by some demon insect that gave me a bacteria infection but I’ll talk about that in another post. WE CLIMBED UP EDORAS! I didn’t know the trek up Mt. Sunday would be so intense, but once we made it to the top, all my feelings of exhaustion disappeared. That was the place where Meduseld stood! Where Eowyn stood elegantly in the wind (oh my god that wind was ridiculous, I don’t know why I even bothered to try and make my hair look presentable that day). The next day we went to the Pelennor Fields and Lake-town refugee locations. We got to charge and scream DEATH, Theoden would have been proud. And Lake Pukaki, oh my god. Gorgeous location! I can’t even begin to describe the bizarre time we had there. I’ll tell you about Ian, the owner, and his 1950’s movie seat transport system another day. Another location we went to was where Pippin dropped his leaf brooch. I’ll never forget Marion’s impression of Gimli! I’ll need to figure out how to post the video on my blog. The second to last day of the tour we went to the Breaking of the Fellowship location, it hurt how fitting that was. I miss everyone! The final day we all did different things, 10 of us did a “Touching Middle-earth Tour”. We went to a few more LOTR locations and played around with weapons. You don’t even know how excited I was to see Herugrim!! I was sad to say goodbye to the people I spent two weeks with but I was also excited because when I got back to Auckland I met Sophie!! We became friends four years ago on tumblr (so many embarrassing memories of our LOTR graphics and gifs). Then the next day I had lunch with Dallas Barnett, Bill Ferny Sr. from DOS! Such a hilarious guy. There has been a slight change in plans for my trip to New Zealand. Instead of going at the end of 2016, I am going at the beginning. In January. Yeah. That is less than a year away and I don’t know what to do with myself! After talking with my mom we concluded it would be better this way which is FINE by me because that means I’m that much closer to Middle-earth! But it also means I have lots of planning to do in a shorter amount of time. I have done research on different tours that are available and in the end I chose Red Carpet Tours. I already sent in my deposit. I’m that ready. There are also other optional activities you can choose, like visiting South Rivendell, kayaking down the same river of the barrel scene, being able to hold Herugrim and the shards of Narsil and so much more! A sketchbook, very important. I’m leaning towards a tan toned one with a hard cover making it easier to sketch. Also because of the color of the paper it would be great paired with some white colored pencils. A few weeks ago my mom told me she has saved up enough miles for me to visit New Zealand!!! This would be my graduation present since I’m planning on finishing college by December and graduating next spring. When she told me I could go to NZ I was in shock because my mom hardly ever acknowledges my love for Tolkien. I was touched and I think I started to tear up a little because she gave me a weird look haha.